Statistics are Deceptive —- The Classical Data Trap !! This is a topic which i had been discussing with lot many friends and analysts but have never got enough time to present or post it in a manner which is simple to understand. The topic for the post is The Classical Data Trap. 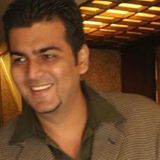 The major problem with all analysts, traders,investors, fund managers and everyone related with the markets is considering the indices like SENSEX , NIFTY as the decision making tool for investments whereas majority of the people tend to have a portfolio which has almost 40-80% of stocks outside the constituents. But everyone tends to forget SENSEX and NIFTY are just a weighted average and there are many such indices which are nothing but a raw set of data. This can be deceptive or prophetic if one does aqequate reading and practical understanding of the same. We do see lot many brokerages reports, fund houses report may it be with a p/e , fundamental view and a technical view but we rarely think on the inter-relationships or data divergences. This would have helped people who went for investment research 🙂 and some home work. Now let us see the current index in respect with OCTOBER LOWS and MARCH LOWS. Majority of the positions all through Feb/March were short ( we too traded short ) but majority of the traders look towards Nifty as the criteria for all decisions. The Nifty snapped back quickly from 2540 and never looked back trapping many shorts which kept on adding positions . The earlier consensus was 1900-2100 Nifty which shifted to 2400 closer to previous bottom. This was based on the assumption of a re-test of lows at least or a newer low. 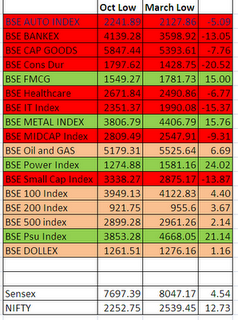 Re-test of lows was completed in majority of the indices considering only BSE ( i like it coz its floating mkt cap ) . 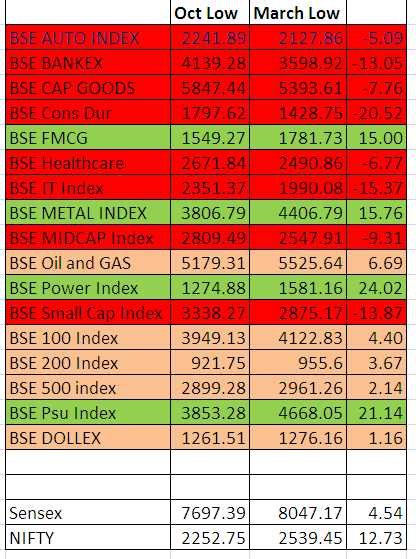 8 indices made newer lows.5-20% lower then october. 5 indices came close to 5-7% of October lows. Only 4 indices reversed from 7-20% higher. Sensex made a low of close to 5% to October low. Nifty made a low which was away by 12.5% . DOLLEX i.e Sensex in terms of Dollars ( index for FII money in simple terms ) came 1% near to October lows. Majority of the BEAR camps were left waiting for an idealistic re-test of lows on Nifty ( traded index) whereas everything apart from it went to newer lows giving ample opportunities and screwing up the market consensus. The ideal bottoming out scenario was completed but nobody realized it.Markets did make new bottoms or re-testing in majority of the stocks and indices but did FOOL lot of index traders who were deceived by statistics !!! This alongwith faster retracement of downmoves was one of the prime reasons apart from our technical analysis to become highly bullish at 9.5k -10.5k and give a target of 14.5k with a lot of investment picks discussed and bought.